From The New Zealand Garden Journal (Journal of the Royal New Zealand Institute of Horticulture), Vol. 2, No. 4, December 1997, pp. 8-11. 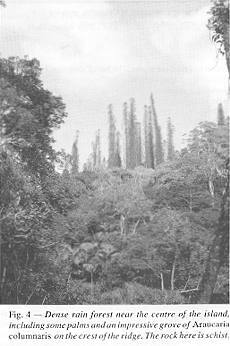 An Australian plant collector, Alistair Watt, recently described New Caledonia as having one of the richest and most beautiful floras in the world and further stated "Since 1987, I have developed a 'love affair' with New Caledonia, much as Kingdon-Ward and Forrest felt about western China". 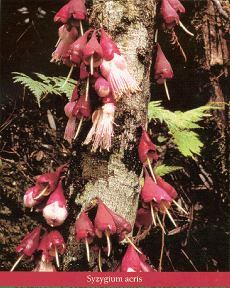 Watt took seeds, collected during five expeditions, back to Melbourne, where a special section is now being developed at the Botanic Garden "to exhibit the best and most interesting of these new floral treasures". Some nurseries are also looking at bringing some of these novelties into more general cultivation. I have visited New Caledonia 15 times over more than 30 years to undertake botanical research, particularly into the family Myrtaceae. In 1992 and 1994 Rob Lucas accompanied me and we collected seed of a number of species of horticultural merit. This seed went to several recipients in the North Island, including Victoria University, the Wellington Botanic Garden and the Auckland Regional Botanic Garden. There are now well grown young plants of a number of species. At the Wellington Botanic Garden some of these will be tried in containers in the Begonia House and others will be planted in suitable sheltered sites in the open. New Caledonia lies about half way between North Cape and New Guinea at 20-22 degrees south. The main island is long and narrow, 400 km long by 40-60 km wide, which are approximately the dimensions of the North Auckland Peninsula. New Caledonia though is ruggedly mountainous with some peaks more than 1600 m high. The climate is tropical, although the relatively high latitude means that there is a 'winter' season that can sometimes be cool but certainly not cold. Rainfall is higher in the east than the west, the normal pattern in the tropics, and is probably everywhere sufficient to support forest of some type, even on the mountain tops. However, those arriving in New Caledonia for the first time at Tontouta Airport in the west, might wonder whether they had arrived in Australia by mistake. They see dry looking hills covered with green, white trunked trees that could be a species of Eucalyptus. 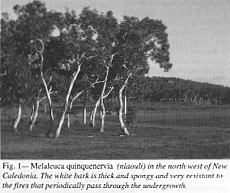 It is in fact a very fire resistant species of Melaleuca, M. quinquenervia, known locally as 'niaouli'. However, the more observant visitor might notice that in gullies on the hills there are patches of dense, dark green rain forest. The gullies give some protection from the fires that blaze all too frequently on these slopes. 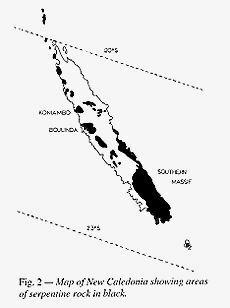 Before humans arrived with their fire some thousands of years ago, it is thought that the western side of New Caledonia was covered by dense forest. There are still extensive rain forests at higher altitudes in the mountains and on the wetter east coast, but even here there can be incursions by fire in the drier season. The other factor that sometimes inhibits the development of forest is much more ancient and botanically more interesting, as it has lead to the evolution of many unusual and sometimes very attractive species over millions of years. This factor is serpentine rock which occupies a third of the area of New Caledonia. This rock type is very low in mineral nutrients useful to plants and is often high in toxic metals, such as nickel and chrome. The soil derived from this rock can usually only support sparse and stunted vegetation able to tolerate the infertility and toxicity. Serpentine rock is found in New Zealand on Dun Mountain near Nelson and in the Olivine Range in Fiordland. In New Caledonia the largest serpentine area is in the southern third of the main island, where it is easily accessible from Noumea. The landscape here differs from that elsewhere in New Caledonia. There are a series of wide basins, with swamps or small lakes in their lowest parts surrounded by hills. On the level sites and the ridges of the hills there is a sometimes dense cover of shrubs or small trees, the latter often having a distinctive candelabra arrangement of their branches. In the gullies and valleys of the hills tall forests sometimes develop with some very big trees, including species of Araucaria and the related Agathis (includes our kauri). This southern vegetation is rich in species and many of them are attractively shaped and in some cases bear large brightly coloured flowers. Plant families with a long history in the southern hemisphere are strongly represented. The conifer genera Araucaria and Agathis have already been mentioned. 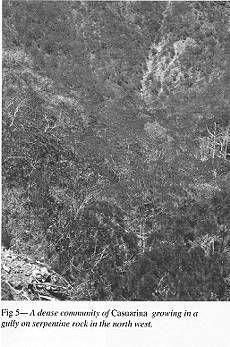 Species of Araucaria are the most distinctive trees of New Caledonian landscapes, ranging, with different species, and on all rock types, from the coast along the ridges of hills, up to the mountain tops. Along the coast the most notable species is Araucaria columnaris with its pencil or rocket-like shape, sometimes 70-80 metres tall by a metre or so wide. Of the 19 species of Araucaria in the world, 13 are restricted to New Caledonia. There are also other conifers of the podocarp family, to which most New Zealand conifers also belong. 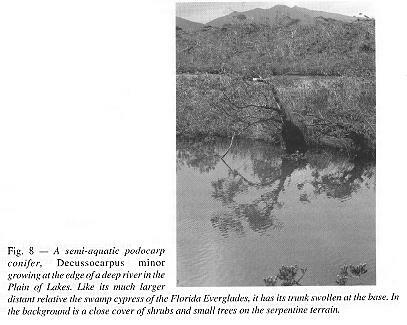 Among flowering plants the Casuarina genus is also prominent in this southern region. The New Caledonian species are attractively shaped with densely rounded crowns. Species of Nothofagus are also present, although their leaves are a surprise as they are much larger than those of our species. The Protea family is conspicuous and includes spindly small trees of Grevillea with large pink or cream inflorescences. The Cunoniaceae include species related to our kamahi, but many of them are dense, rounded shrubs with bright pink, red, or yellow flowers. Other members of this family have the flowers crowded in spherical heads. The family Myrtaceae, the largest in New Caledonia, is also strongly represented. There are relatives of our ratas with bright red flowers and many other genera with fleshy or dry fruits. 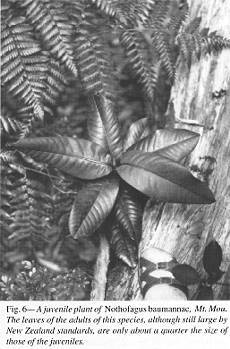 The most notable genus horticulturally though is Xanthostemon, ranging throughout the island, mostly on serpentine. The flowers of the 22 species are large and mostly bright red or yellow. 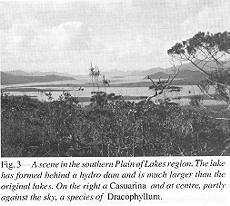 At higher altitudes on the mountains in the north of the southern serpentine region, and on island-like serpentine mountains ranging to the far north, different species or different genera appear. There are Araucaria of candelabra form and other species that are so short they could qualify as bonsais by comparison with the tall coastal trees. A notable incomer at these higher sites is the only other species of Xeronema in the world, X. moorei. It is often very abundant on rocky sites. It is a smaller species than ours, but still highly attractive when in flower. 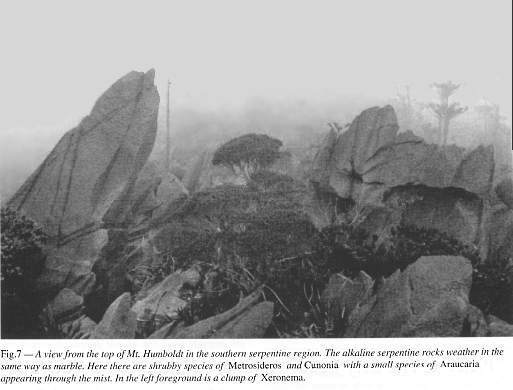 Rain forests on soils derived from normal rocks, greywacke, schist etc., have a different aspect. Conifers are less conspicuous with tree ferns and palms being more prominent. Among the tree ferns are two species that may be the tallest in the world, up to 30 metres in height with trunks up to a metre in diameter near the ground. Higher altitude tree ferns are miniatures by comparison with very slender trunks. There are 36 species of palm, many of them with slender, elegant and sometimes very tall trunks. A few botanical curiosities have evolved in New Caledonia. In the Plain of Lakes region in the far south there is a dwarf semi-aquatic podocarp conifer. Its short, often submerged trunks, at the edges of rivers or lakes, are conspicuously swollen at the base. At the same locality there is an always completely submerged species of Blechnum fern. It grows out from crevices in deep river pools. Most remarkable of all, however, is the only known parasitic conifer in the world, appropriately named Parasitaxis. It is a spindly shrub, with dark red-purple foliage, that parasitises the roots of another podocarp conifer. Botanically, New Caledonia is a fascinating place with its strong representation of ancient southern hemisphere families as well as tropical Asian families. The evolution of distinctive and attractive species on the serpentine terrain adds a further interesting dimension. Horticulturally too, New Caledonia has much to offer. Its potential in this respect is only just beginning to be realised. Dr. John Dawson is Senior Associate in the School of Biological Sciences, Victoria University of Wellington. He has a particular interest in the flora of New Caledonia and has written the first of two volumes on Myrtaceae for the Flora of New Caledonia. He is currently working on the second volume.